Every now and then, although in truth not that often, someone truly exceptional explodes onto the national stage and stops all of us in our tracks. That person right now is Vicky Phelan. As the woman at the centre of the ongoing cervical screening scandal, her courage, tenacity and strength have both inspired and humbled in equal measure. There’s just something about Vicky. One week ago, Vicky Phelan was not a household name, yet now everyone in the country knows her. In cafes, bars, shops, at school gates the length and breadth of this small Island, endless conversations are taking place about Vicky, this warrior woman. As a direct result of her compelling honesty and openness in the way she has shared her story, we all collectively feel that we know her well. We care a lot about her, feel angry about what happened, want her to be listened to, and above all else, we desperately want her to get better so she can grow old with her husband Jim and precious children Amelia and Darragh. Every so often a massive story will break and stops all of us journalists in our tracks. As of this moment, that story is the cervical screening scandal. It seemed to come out of nowhere. Sometimes when a big story surfaces, it’s been expected, we all know it has been coming down the tracks. Not this one. A court case ended last Wednesday, which few of us were following in any depth. An unknown woman called Vicky Phelan and her husband Jim walked out holding hands onto the footpath outside the Four Courts after Vicky had received a settlement of €2.5m euro from a US based lab over a wrong smear test. In a few short sentences, a story of explosive magnitude and importance began. I first heard the details on the car radio while collecting my youngest son Jamie from his National School in Rathmines – the moment I heard Vicky speak, I knew it was going to be massive. "It was at that moment, outside the courts, that we all began to care about Vicky"
Here was a 43-year-old mother of two young children, with cervical cancer, given six to 12 months to live, breaking down in tears as she spoke about being dragged through the courts and now just wanting to use the money to prolong her life so she can see her children grow up – it was just heartbreaking. There was also anger on Vicky’s part, anger that this had happened to her, anger that it was three years before she was told that her smear test was misread, anger that she had been dragged through the courts, that she had been asked to sign a confidentiality agreement – her anger was as powerful as her tears. It was at that moment, outside the courts, that we all began to care about Vicky. After collecting my son, I immediately called my radio producer Sian O'Gorman to suggest we try to get Vicky on our radio show ‘Sunday with Miriam’. I wasn't sure Vicky would feel up to doing any interviews, but my journalistic instinct is you always have to ask - and ask quickly, unless it is inappropriate and insensitive. Sian loved the idea, she had been following the case closely and we both agreed she would contact Vicky’s solicitor Cian O' Carroll to put in a request. I watched all the coverage of Vicky’s story unfold on television that Wednesday evening, from the 6:1 news onwards. The more I watched and listened to the details, the more impressed I was by this extraordinary woman. It was not at all surprising to hear that Mr Justice Cross, the judge who heard her case, described Vicky as the most impressive witness he had ever come across in his long career. I really wanted to meet Vicky and hoped she might speak to me. It is one of the primary reasons I love my job – being a journalist has given me the chance to interview truly exceptional people throughout my career. Sometimes they are at the centre of a massive story, sometimes they are not. It is always a privilege, one I never take for granted. I also always feel a huge responsibility to make sure that if I do get the opportunity to interview someone like Vicky, asking them to tell a very difficult and painful story to the nation, that we give them plenty of time and endless empathy. The following morning Sian called to say it was a 'yes' from Vicky – great news. We decided that instead of dragging her up to Dublin to do our show live on the Sunday morning, we would travel to Limerick where she lives and do the interview there on the Friday morning. "Even the people who run our canteen sent over free sandwiches and drinks, when they heard Vicky was coming in"
It was a special moment when Vicky walked into the studio. She had become the most well known woman in Ireland, everyone was talking about her, and here she was with us. Big hugs all round, photos and selfies done, we sat down to chat. Vicky was just as wonderful as I knew she would be and gave us a fantastic interview. Radiating positivity and strength, Sian and I left floating on air. What a privilege it was to be in her presence. When the interview went out on Sunday morning, listeners immediately loved her. One summed it up best of all – ‘I can’t get out of my car as I am stunned and transfixed listening to this incredible woman’. In a similar vein, I wasn’t at all surprised to see the audience give Vicky a standing ovation when she had appeared on Ray D'Arcy’s chat show the night before. We exchanged numbers and promised to stay in touch. That came in very handy a few days later when I was in my office preparing for Tuesday night’s Prime Time. The cervical smear story was getting even bigger and Vicky was still central to all the coverage. It was also a fast moving story and lots of things had happened since we had met. I suggested to my Prime Time team that we should ask Vicky if she would consider responding to the latest developments on our show. The superb Prime Time editorial trio of Donogh Diamond, Paul Tanney and Paulette O'Connor all said 'go for it'. I texted Vicky asking her how she might feel about talking to me on Prime Time. 'Leave it with me', she texted back, 'I just need to think and organise a few things'. In no time at all she was back in touch to say she would be happy to come into our studio in Dublin. 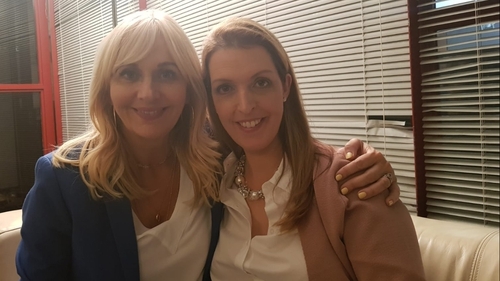 I spoke to Prime Time’s Rhona O'Byrne, who looks after us all so well, and she made sure that Vicky was driven up to Dublin and that our hair and make up department were aware that a very special person was en route. Even the people who run our canteen sent over free sandwiches and drinks, when they heard Vicky was coming in. In the end, it was really important that Vicky came to Dublin as the story continued to develop throughout that day. Not long before we went on air, Health Minister Simon Harris made a striking new revelation in the Dáil that there were a considerable number of other women with cervical cancer who did not have their smears audited. That was my first question to Vicky as our Prime Time interview began – it was electrifying for the programme to get her first response. The magic of live television. As we walked across the studio just before we went on air we were chatting, and Vicky mentioned she had just got a call from the Taoiseach, the first call from him since the controversy began. I knew this was newsworthy and asked Vicky if she would mind me raising this with her on air. 'Not at all', she said. Vicky once again delivered an incredibly powerful interview. Once again, I felt privileged to to be in her presence. When the programme ended, Vicky, myself, my wonderful co-presenter David McCullagh and the rest of the Prime Time team went to our Green Room where we had a few drinks and chatted until late. It was a special time. I think everyone felt like me, that we were all in the presence of greatness.